164 pages | 4 B/W Illus. Greenland and the International Politics of a Changing Arctic examines the international politics of semi-independent Greenland in a changing and increasingly globalised Arctic. Without sovereign statehood, but with increased geopolitical importance, independent foreign policy ambitions, and a solidified self-image as a trailblazer for Arctic indigenous peoples’ rights, Greenland is making its mark on the Arctic and is in turn affected – and empowered – by Arctic developments. 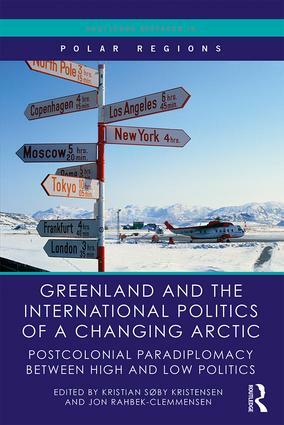 The chapters in this collection analyse how a distinct Greenlandic foreign policy identity shapes political ends and means, how relations to its parent state of Denmark is both a burden and a resource, and how Greenlandic actors use and influence regional institutional settings as well as foreign states and commercial actors to produce an increasingly independent – if not sovereign – entity with aims and ambitions for regional change in the Arctic. This is the first comprehensive and interdisciplinary examination of Greenland’s international relations and how they are connected to wider Arctic politics. It will be essential reading for students and scholars interested in Arctic governance and security, international relations, sovereignty, geopolitics, paradiplomacy, indigenous affairs and anyone concerned with the political future of the Arctic. 4. The Arctic Turn: How did the High North become a Foreign and Security Policy Priority for Denmark? Kristian Søby Kristensen is Deputy Director and Senior Researcher at the Center for Military Studies, Department of Political Science, University of Copenhagen. With a background in international relations, his academic interests are war and strategy, Arctic politics, Danish and European security and defence policy as well as issues of public safety and security. Jon Rahbek-Clemmensen is Assistant Professor at the Department of Political Science and Public Management at the University of Southern Denmark, where he is affiliated to the Center for War Studies. He holds a PhD in international relations (LSE) and has been affiliated to Columbia University and CSIS. His research interests include European security, Arctic politics, Danish foreign and security policy, and civil–military relations.